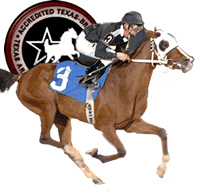 (Forney, Texas - November 22, 2011) - Online bidding is now open for the Texas Thoroughbred Breeders Association (TABA)'s 2012 Stallion Breeding Acution. TABA invites Arabian breeders to obtain breedings to top athletes for your mares and contribute to the growth of Arabian Horse breeding and racing. Bidding closes on January 28, 2011. Click here to see a list of stallion seasons available and more information about TABA's 2012 Stallion Breeding Auction. For a limited time, the TABA is still accepting stallion breedings for the 2012 event. Email TABA Stallion Breeding Auction & Breeding Sales Manager Todd Moak at auction@texasarabianbreeders.com to include your stallion .